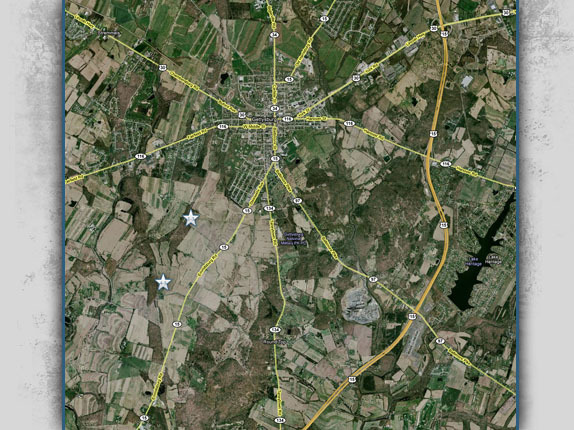 There are over 1300 monuments, plaques, and markers on the Gettysburg Battlefield. 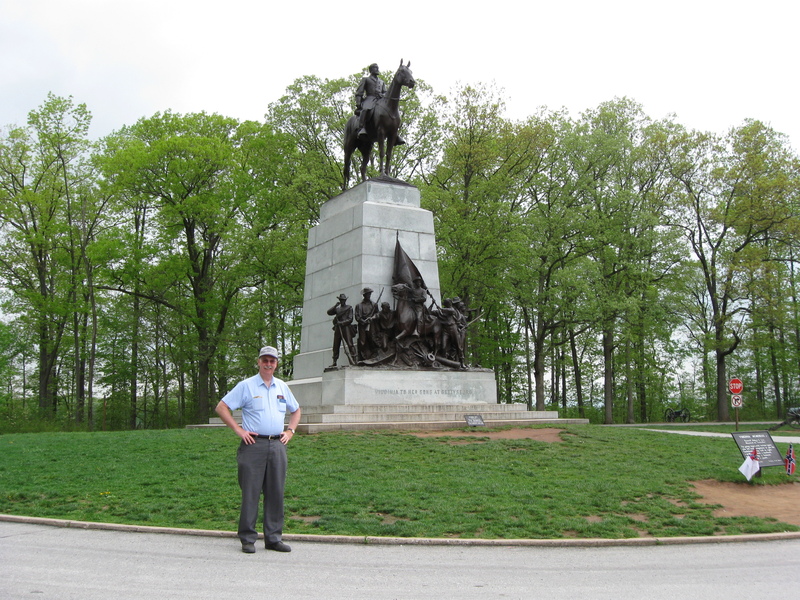 Gettysburg Licensed Battlefield Guide Ed Guy will show us some artwork on a few of the monuments. This view was taken facing west at approximately 5:00 PM on Wednesday, May 6, 2009. Today we begin a series on artwork on some of the monuments at Gettysburg. The Gettysburg monuments are filled with very interesting figures/scenes. Gettysburg Licensed Battlefield Guide Ed Guy will show us some items to notice on the artwork when you’re out on the battlefield. This map shows the locations of the videos in this series. Videos #1-3 were taken at the Virginia State Monument. Videos #4-5 were taken at the Louisiana State Monument. 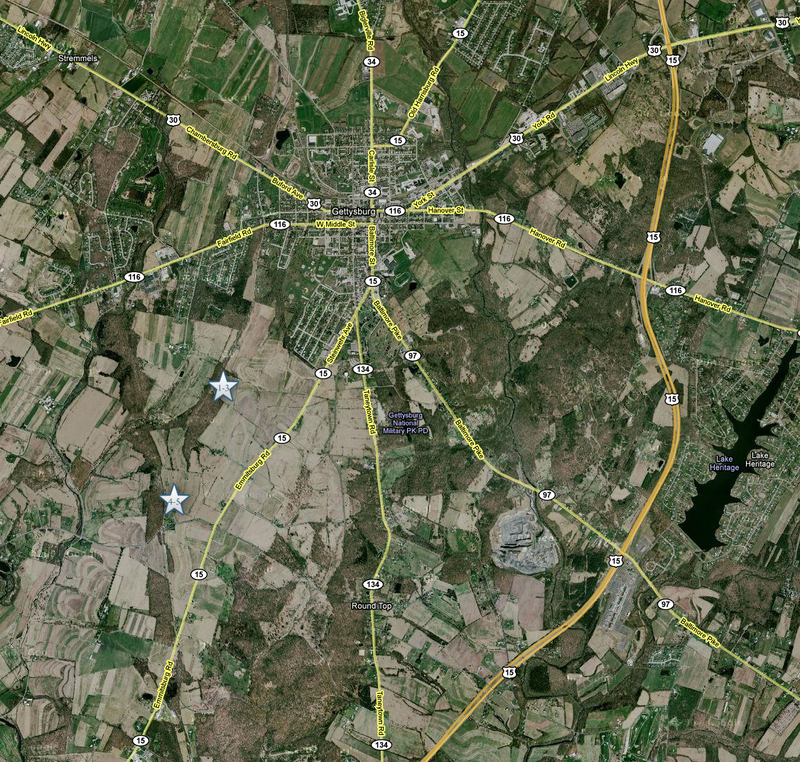 This map was created facing north at approximately 2:20 PM on Sunday, May 17, 2009. 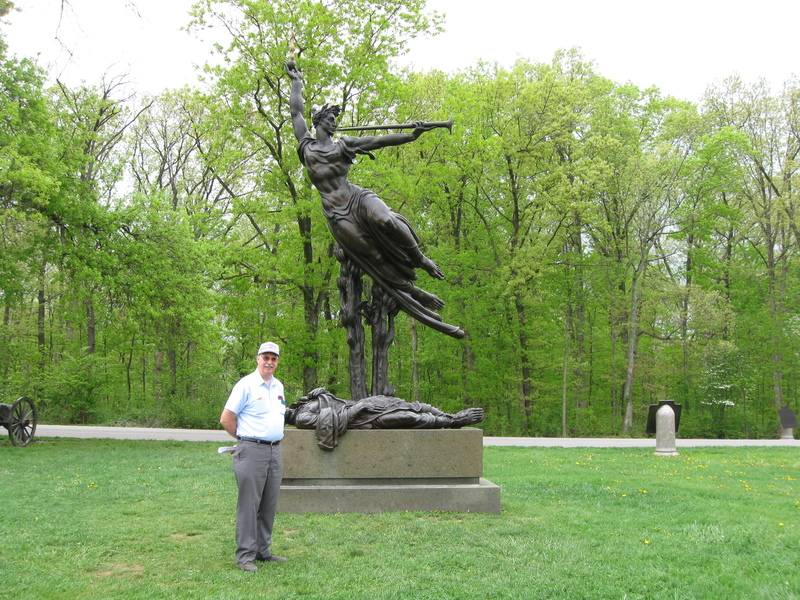 Our host for the series on Gettysburg Artwork is Licensed Battlefield Guide Ed Guy. Ed was formally trained in art, and was a courtroom artist. 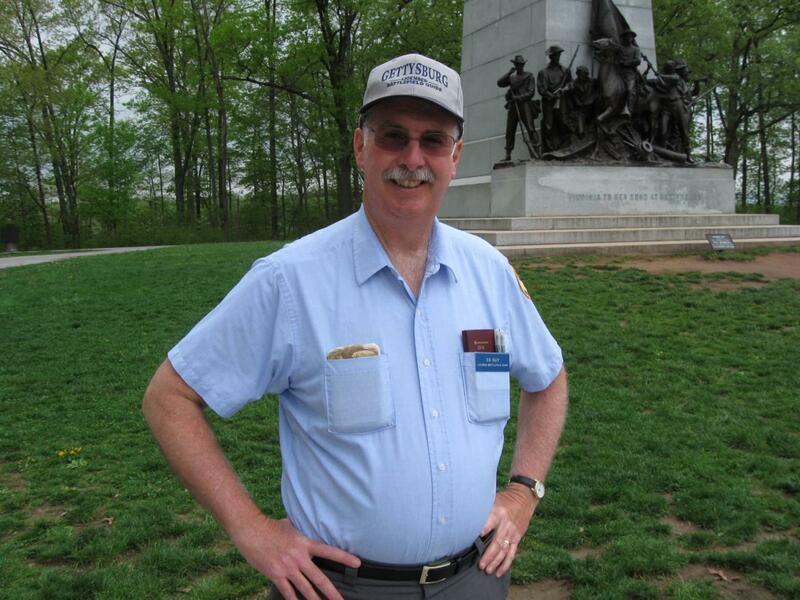 He has been a Gettysburg Licensed Battlefield Guide since 1984. This view was taken facing northwest at approximately 5:00 PM on Wednesday, May 6, 2009. 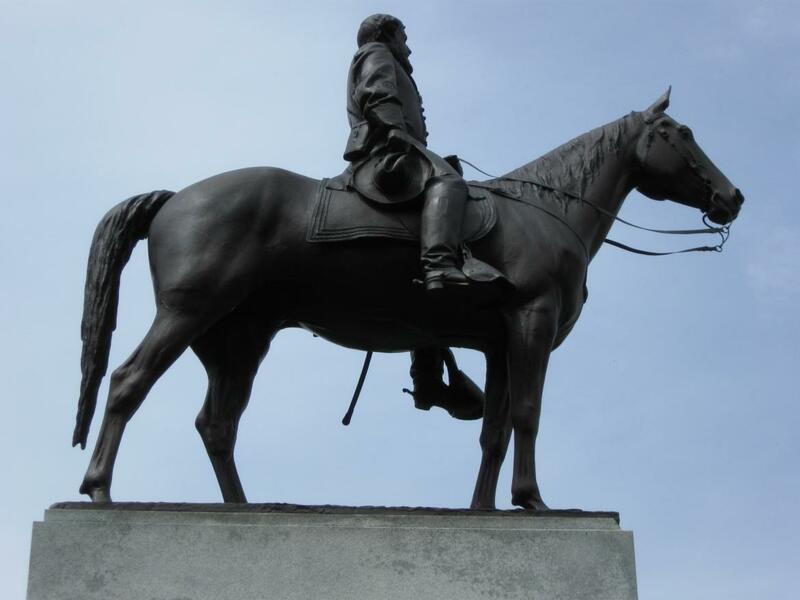 In Video #1 Gettysburg Licensed Battlefield Guide Ed Guy introduces himself and shows how the artists attempts to have your eye move around when you look at the Virginia State Monument. This view was taken facing northwest at approximately 5:00 PM on Wednesday, May 6, 2009. 6441 In Video #2 Ed Guy explains how Robert E. Lee’s “military bearing” made him a very noticeable figure. This view was taken facing northwest at approximately 5:00 PM on Wednesday, May 6, 2009. In Video #3 Ed Guy explains that the artist, Frederick Sievers, finished this monument in 1917. 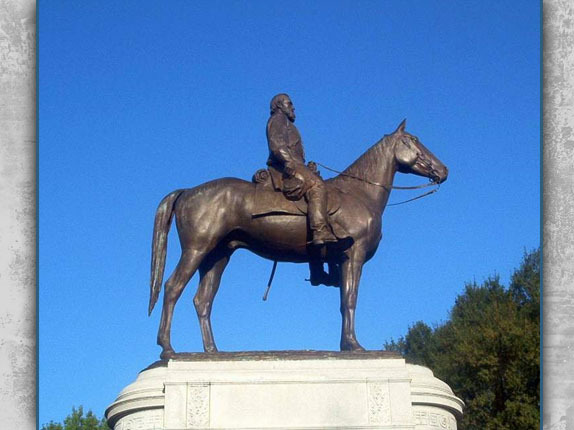 He was able to place a monument of Stonewall Jackson, looking very similar to this one on Monument Avenue in Richmond, Virginia, a couple of years later. This view was taken facing northwest at approximately 5:00 PM on Wednesday, May 6, 2009. The right side (south side) of Lee on Frederick W. Siever’s Virginia Monument. This photograph was taken facing north at approximately 3:00 PM on Sunday, May 17, 2009. 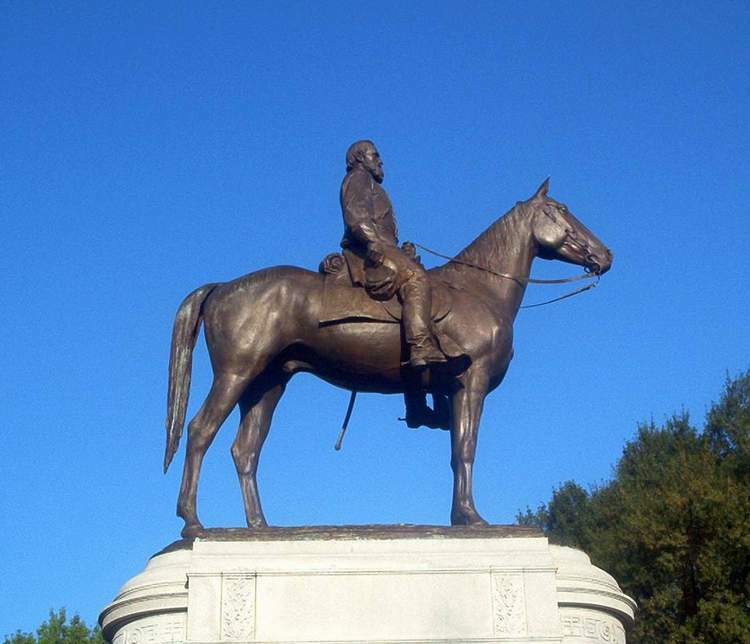 The right side of Frederick W. Siever’s Stonewall Jackson Monument in Richmond, Virginia is very similar to Lee’s statue in Gettysburg. There is a different head, a different hat, and Lee’s statue is missing the bedroll. Also, the fronts legs of the horses are placed a little differently. Artist Donald Delue’s Louisiana State Monument was dedicated in 1971. This photograph was taken facing west at approximately 5:00 PM on Wednesday, May 6, 2009. In Video #4 Ed Guy explains that the artist, Donald Delue, preferred to exaggerate the features of his figures. This view was taken facing west at approximately 5:00 PM on Wednesday, May 6, 2009. In Video #5 Ed Guy tells the story of Barbara, the patron saint of artillery. This view was taken facing west at approximately 5:00 PM on Wednesday, May 6, 2009.